If you’re a dyed-in-the-wool gardener or an experienced floriculturist, then you must have used a hoe for getting rid of the weeds. Weeds that keep cropping up repeatedly even after you’ve uprooted them multiple times not only prey on the vegetation but also make your lawn appear ugly. So, a hoe is an absolute must for any and every gardener worth his or her salt. 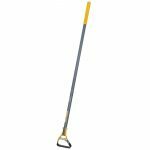 Hoes come ideally handy for prying out brambles, mistletoes, poison ivies, dandelions, and ragweed from their moorings without stressing your back or legs. The basic structure of a hoe comprises an extended shaft to which an angled metallic blade head is firmly attached. As a gardener, you may be aware that a wide range of hoes are available that come with squared, V-shaped, bar-type or elongated blade heads. Basically, there are 4 distinct kinds of hoes-scuffle hoes, chopping hoes, draw hoes, and push hoes. The chief purpose each type serves is made amply clear by the terminology. Push hoes, for instance, shoves you back while you put pressure on them for the sake of digging while the draw hoes gets drawn towards you. Chopping hoes can be identified by their wide and extremely sharp blade heads that help in chopping up thick weeds and hardened soil or clay. A quality scuffle hoe comes with hinges that promotes oscillating action enabling paring on push and pull strokes. The Nejiri Gama Hoe has been designed in Japan, and from the most premium grade of materials. This hoe comes with a 5-inch blade welded out of steel which pries out weeds from their roots and uproots them totally. The hoe can also be used for slicing overgrown branches and tendrils of plants, preparing the soil for transplantation, and for many other gardening tasks. The handle has been crafted from hardwood. Use the True Temper Action Hoe from AMES Companies Inc both as a push and drag hoe for weeding out dead roots, brambles, and dandelions. The innovative design of the hoe also makes it suitable for cultivating, digging, and channeling. Push-pull action slices weeds and brings them out effortlessly. The looped blade has been crafted out of quality steel and the handle is of fiberglass which ensures a long running functional life. 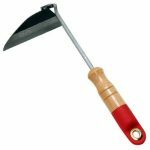 If you consider yourself to be an environmental-friendly gardener or horticulturist, then you should opt for the Rogue Garden Hoe from Prohoe. The blade head of this hoe has been forged out of eco-friendly disc blades used in farming and agriculture. The blade has a width of 7 inches and has been perfectly honed on all its three edges which facilitate slicing in both expansive and confined areas. 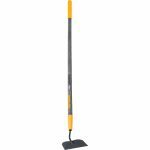 The True Temper Garden Hoe with Hardwood Handle makes the laborious tasks of weeding and slicing hardened soil much less wearisome. 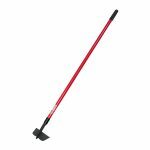 This hoe comes with a 6-inch wide and flat blade crafted out of tempered steel that lets you swiftly cut through stubborn weeds and loosen up solidified soil considerably reducing the time spent in gardening. The long hardwood handle aids in keeping the posture straight which eventually diminishes backaches. Bully Tools is an American company that is reputed for crafting premium quality gardening tools and the Garden Hoe with Fiberglass Handle is an embodiment of the high level of craftsmanship achieved by the manufacturer. A blade head fabricated from 12-gauge tempered steel is supremely suitable for loosening up tough soil and cutting up deep-seated roots. 5 top quality garden hoes with looped blade heads were taken up for review-two models from The AMES Companies, Inc, and one each from Nejiri Gama, Prohoe, and Bully Tools. 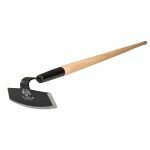 The Prohoe Rogue Garden Hoe stood out from the rest because of its performance-driven blade head that was forged out of recyclable steel material while the model from Nejiri Gama emerged as the best buy.